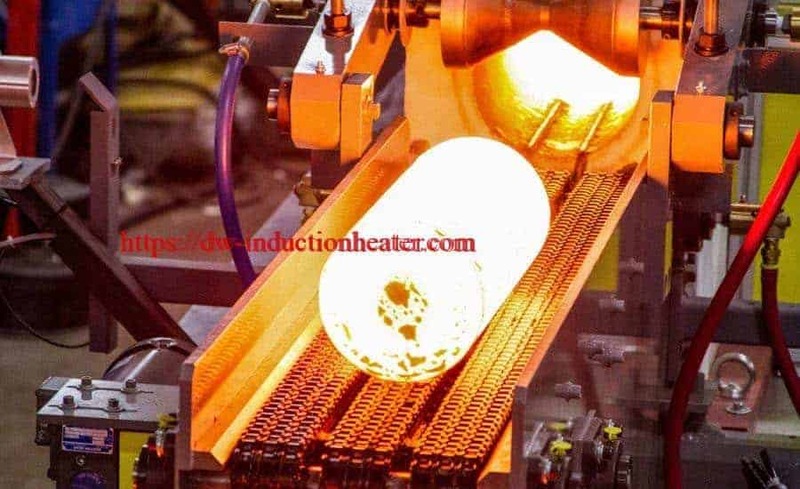 Induction hardening uses induced heat and rapid cooling (quenching) to increase the hardness and durability of steel.Induction heating is a no-contact process that quickly produces intense, localized and controllable heat. With induction, only the part to be hardened is heated. Optimizing process parameters such as heating cycles, frequencies and coil and quench design results in the best possible outcomes. 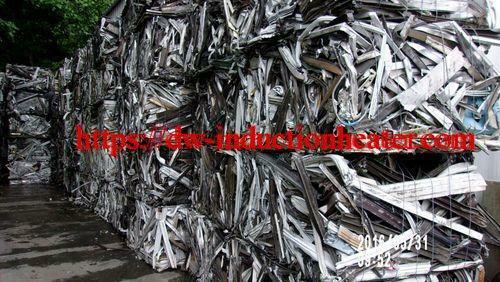 Induction hardening boosts throughput. It is an extremely fast and repeatable process that integrates easily into production lines. 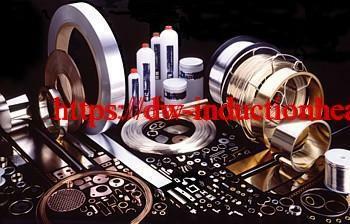 With induction it is usual to treat individual workpieces. This ensures each separate workpiece is hardened to its own precise specifications. The optimized process parameters for each workpiece can be stored on your servers. Induction hardening is clean, safe and typically has a small footprint. And because only the part of the component to be hardened is heated, it is extremely energy-efficient. Induction heating is used to harden numerous components. Here are just a few of them: gears, crankshafts, camshafts, drive shafts, output shafts, torsion bars, rocker arms, CV joints, tulips, valves, rock drills, slewing rings, inner and outer races. Brazing and soldering are processes of joining similar or dissimilar materials using a compatible a filler material. Filler metals include lead, tin, copper, silver, nickel and their alloys. Only the alloy melts and solidifies during these processes to join the work piece base materials. The filler metal is pulled into the joint by capillary action. Soldering processes are conducted below 840°F (450°C) while brazing applications are conducted at temperatures above 840°F (450°C) up to 2100°F (1150°C). The success of these processes depends upon the assembly’s design, clearance between the surfaces to be joined, cleanliness, process control and the correct selection of equipment needed to perform a repeatable process. Cleanliness is ordinarily obtained by introducing a flux which covers and dissolves dirt or oxides displacing them from the braze joint. Many operations are now conducted in a controlled atmosphere with a blanket of inert gas or combination of inert / active gasses to shield the operation and eliminate the need for a flux. These methods have been proven on a wide variety of material and part configurations replacing or complimenting atmosphere furnace technology with a just in time – single piece flow process. Brazing filler metals can come in a variety of forms, shapes, sizes and alloys depending on their intended use. Ribbon, preformed rings, paste, wire and preformed washers are just a few of the shapes and forms alloys that can be found. The decision to use a particular alloy and/or shape is largely dependent on the parent materials to be joined, placement during processing and the service environment for which the final product is intended. 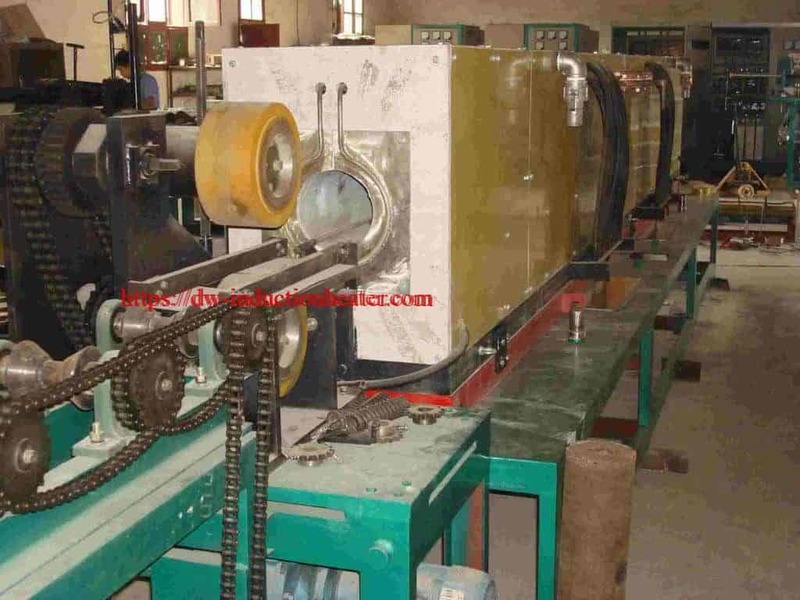 Clearance between the faying surfaces to be joined determines the amount of braze alloy, capillary action / penetration of the alloy and subsequently the strength of the finished joint. The best fit up condition for conventional silver brazing applications are 0.002 inches (0.050 mm) to 0.005 inches (0.127 mm) total clearance. Aluminum is typically 0.004 inches (0.102 mm) to 0.006 inches (0.153 mm). Larger clearances up to 0.015 inches (0.380 mm) usually lack sufficient capillary action for a successful braze. Brazing with copper (above 1650°F / 900°C) requires the joint tolerance kept to an absolute minimum and in some cases press fit at ambient temperatures to assure minimum joint tolerances while at the brazing temperature. Induction systems provide a convenient and precise way to quickly and efficiently heat a selected area of an assembly. Consideration must be given to the selection of power supply operating frequency, power density (kilowatt applied per square inch), heating time, and induction coil design to provide the required depth of heating in a specific braze joint. 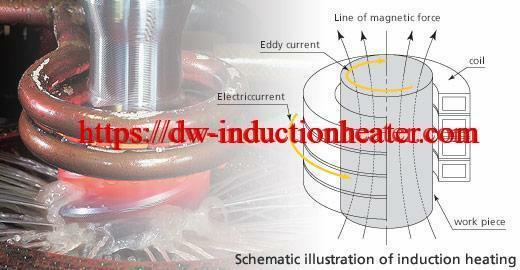 Induction heating is non-contact heating by means of transformer theory. The power supply is an AC source to the induction coil that becomes the primary windings of the transformer while the part to be heated is the transformer’s secondary. The work piece heats by the base materials’ inherent electrical resistivity to the induced current flowing in the assembly. Current passing through an electrical conductor (the workpiece) results in heating as current meets resistance to its flow. These losses are low in current flowing through aluminum, copper and their alloys. These non-ferrous materials require additional power to heat than their carbon steel counterpart. The alternating current tends to flow on the surface. The relationship between the frequency of the alternating current and the depth it penetrates the part is known as the reference depth of heating. Part diameter, material type and wall thickness can have an effect on heating efficiency based on the reference depth. 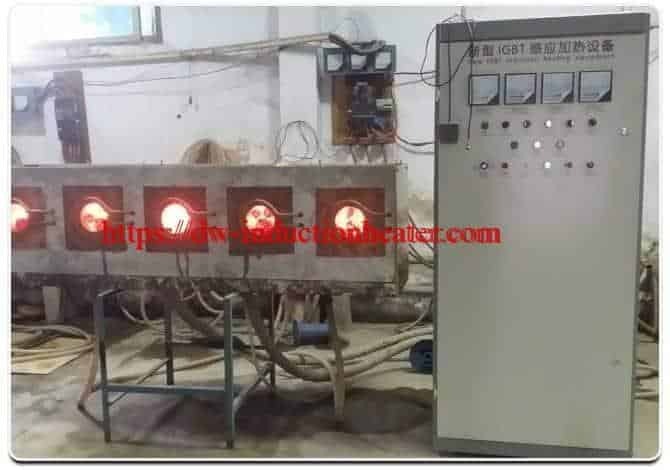 The top 200^1200kg Induction Heating Aluminuim Can Recycling Furnace for recycling and melting aluminum scraps,ingots,cans and dross material. 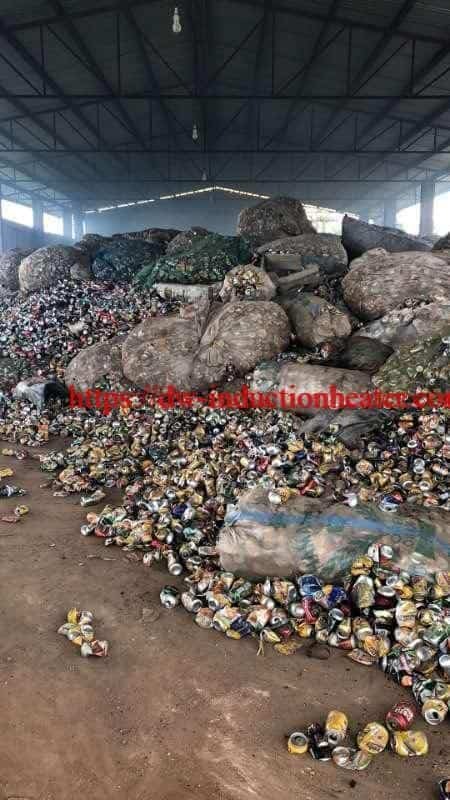 An Induction Aluminum scraps/ingots/cans recycling furnace operator will place aluminum parts or aluminum ingot/scrap as a charge in the induction melting aluminum recycling furnace and start the furnace to begin the melting process. Adding more aluminum charge this process is advisable as molten aluminum transmits the heat better. When temperature of the aluminum reaches 1220.66°F it turns to liquid. Any residue from the coating and paint from the cans will float on the surface. This byproduct is called dross and can be skimmed by a steel ladle. This needs to cool before it can be disposed off safely. Next, the crucible (furnace) will pour out pure aluminum. Usually, Hydraulic tilting mechanism provided to pour large quantities of liquid metals. Finally, with care, the molten aluminum will be poured into mould to cool down and then slide out for use. 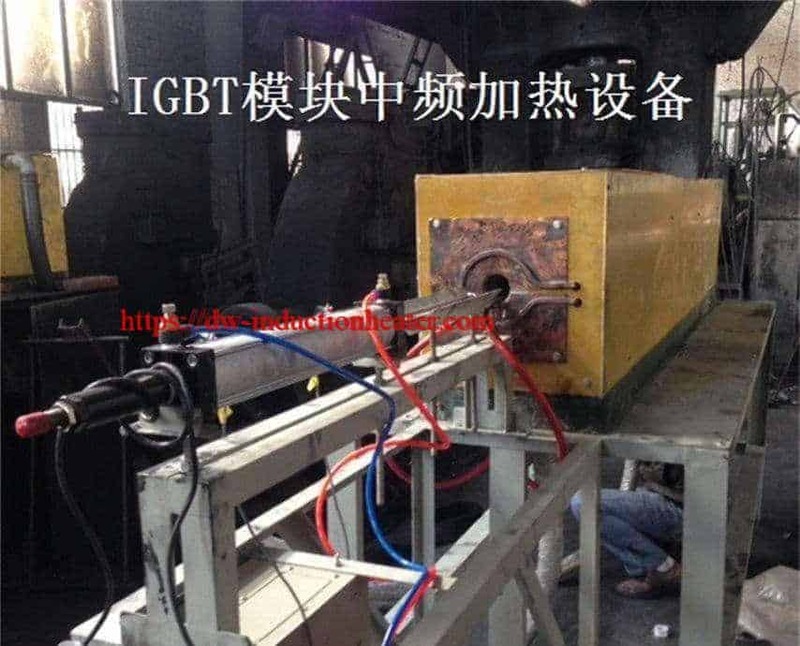 Original diesel furnace workshop on pollution, but also the auxiliary exhaust pipeline, inside and outside the furnace heat has a large number of distribution in the workshop, resulting in high temperature workshop. 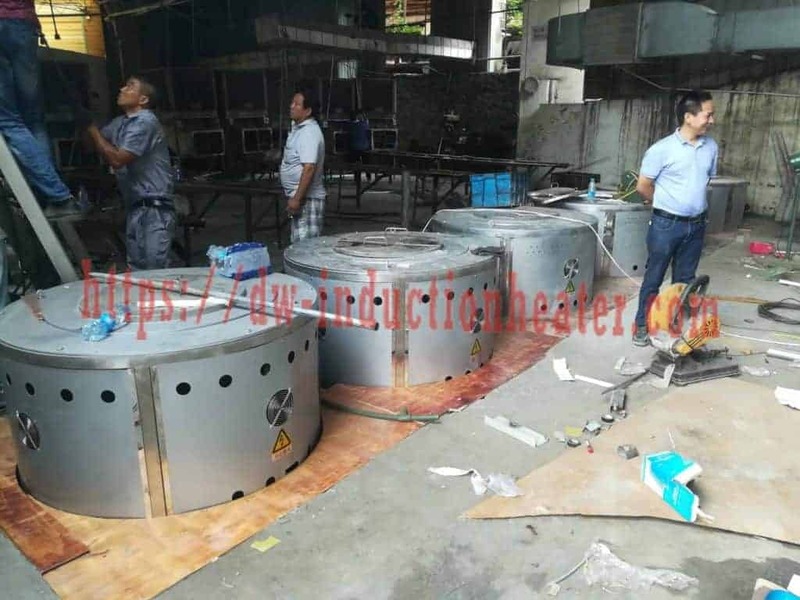 So is the original furnace condition, most escapes to the air, there is heat conduction loss, the production of large power consumption, increase the cost of production. At the same time, the ambient temperature increases. 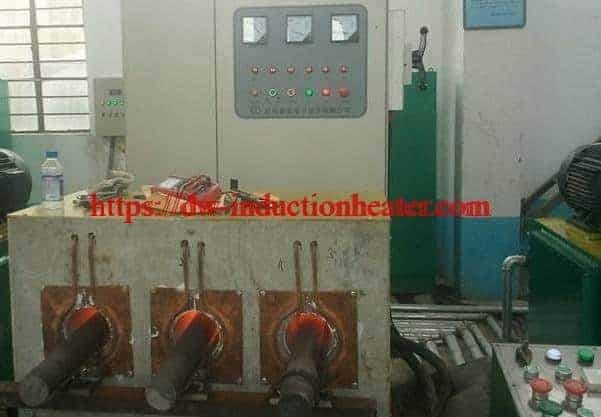 The electromagnetic induction heating process, the heating element is through magnetic field heating, in order to reduce the loss of heat conduction, fast heating, melting rapidly, thus reducing energy consumption. Reduce electricity consumption. After the comparison of the experimental test and modification, the power saving effect is 20%-40%. 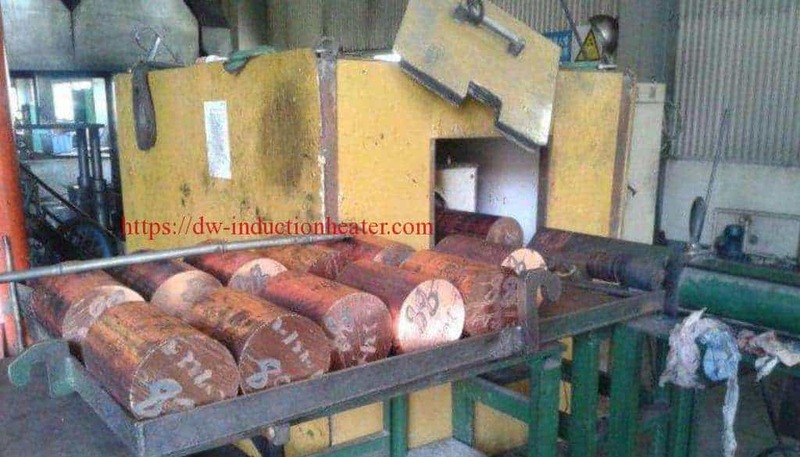 Electromagnetic induction heating method is through the magnetic field lines make heating rapid heating, the rapid melting Aluminum Alloy. The temperature control is real-time and accurate, which improves the quality of the product and improves the production efficiency! The traditional electric melting induction furnace heating method is to use resistance wire heating, resistance wire in the high temperature environment for a long time in the use of oxidation will result in reducing its service life, high maintenance costs. The electromagnetic heating coil is made of insulating material and high temperature wire, so the service life is long and without any maintenance. 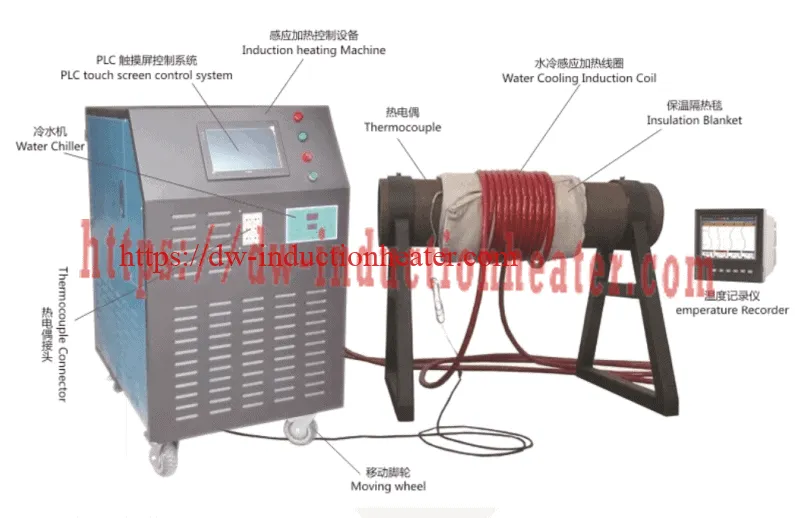 Electromagnetic induction heating with the development and maturity of the technology, the production process and technology of components, software, such as reliable protection of the current power can be 2-200KW. 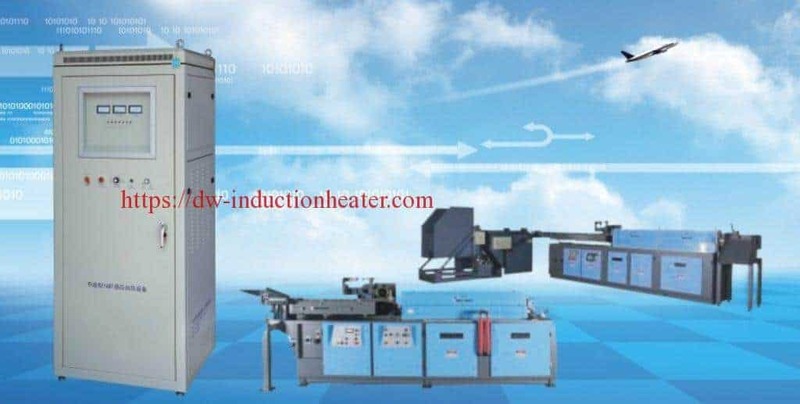 The utility model adopts the electromagnetic induction heating, which can reduce the surface temperature of the machine, and the human body can be safely touched, so as to avoid the occurrence of burn and scald accidents caused by the traditional heating mode and protect the production safety of the employees. 1 energy saving and environmental protection, Germany’s IGBT power devices, high reliability, stable operation and low maintenance costs. 2) the frequency of the digital phase locked loop tracking, automatic load impedance matching. 3 power closed-loop control, to avoid the temperature change caused by the power down. 4) over voltage, under voltage, lack of phase, over current, over heat protection, real-time display of the parameters, fault diagnosis and alarm; leakage automatic alarm, cut off the power supply and the working state of real-time display. 5) PID heating control system, uniform heating temperature, prevent molten aluminum temperature drift, burning less, homogeneous metal components to improve the product qualification rate. 9 (100%) load duration, maximum power, to ensure the operation of 24 hours. For heating various of bar materials: such as steel & iron, bronze, brass, aluminum alloy, etc. Picture just for reference, color is changable with different power. Functions and special specifications customized by customer’s requirements. 1.Automatic:Automatic feeding, automatic selection of the work-piece is good or bad, automatic measurement of temperature, automatic discharge. 2. Integrated design: Save installation time,cost and space. 3. Operation panel embedded displays machine operating states, to facilitate fault diagnosis. 3 Safe and reliable No high voltage, very safe to your workers. over-current, over-voltage, over hot, water shortage etc. These lamps can control and protect machine. Ensure the long-life of the machine. In the induction billet heating furnace the whole of the billets or slug is heated. Normally for short billets or slugs a hopper or bowl is used to automatically present the billets in line to pinch rollers, chain driven tractor units or in some cases pneumatic pushers. The billets are then driven through the coil one behind the other on water cooled rails or ceramic liners are used through the coil bore which reduce friction and prevent wear. The length of the coil is a function of the required soak time, the cycle time per component and the length of the billet. In high volume large cross section work it is not unusual to have 4 or 5 coils in series to give 5 m (16 ft) of coil or more. 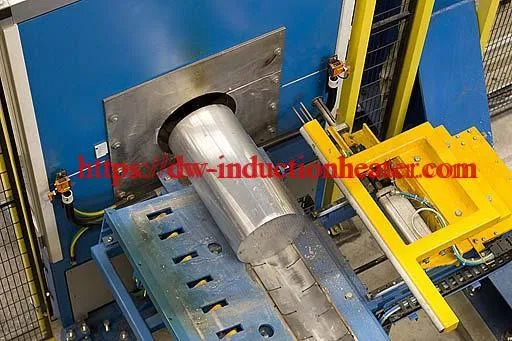 HLQ Induction Equipment Co is the World leader in the design and manufacture of induction heating products including those for induction bar end heating applications. Higher production rates can be achieved with the use of multiple solenoid coils while channel induction coils facilitate material handling of long bars through the use of chain conveyors to continuously feed the bars through the C-shaped coil. 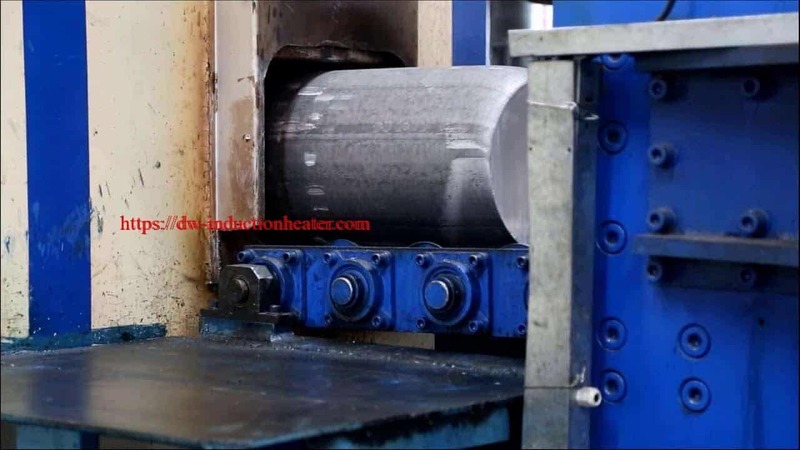 Continous Aluminum Billet Heating Furnace/Aluminium Alloys Billet Heater for the heating Aluminum Billets/Rods/Bars before the hot formging, extrusion, hot rolling and cutting,etc. Induction Heating is a proven, reliable and efficient method of heating hot forming aluminum alloys. However, aluminum alloys have material properties that, if unaccounted for, can result in unexpected challenges. 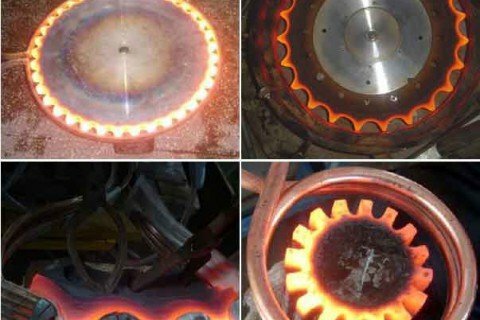 Understanding the unique facets of the induction heating of aluminum can be achieved by considering the properties that make aluminum alloys such advantageous materials. Given that aluminum and its alloys offer numerous advantages over many other metals, it is not surprising that inquiries about induction billet-heating equipment increasingly involve the heating of aluminum alloys. 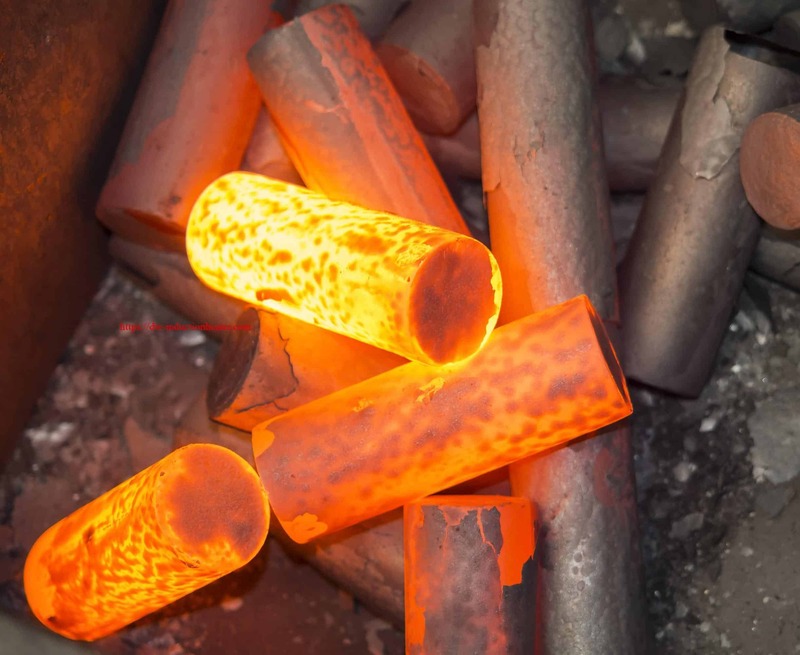 Many of these inquiries focus on how the induction heating of aluminum differs from the induction heating of other materials – typically steels – and how these differences affect heating quality, efficiency and productivity. Electromagnetic induction is well-suited for the heating of aluminum-alloy billets. However, there are some critical, yet easily overlooked, realities of aluminum billet heating that should be considered when designing, operating and maintaining this type of equipment. Fundamentally, the induction heating of aluminum alloys is no different than that of other common materials (e.g., carbon-steel and stainless steel alloys). It is ultimately material-property differences that set apart the induction heating of aluminum alloys from other metals. These material-property differences, if unaccounted for, can result in unexpected equipment performance and practical challenges. 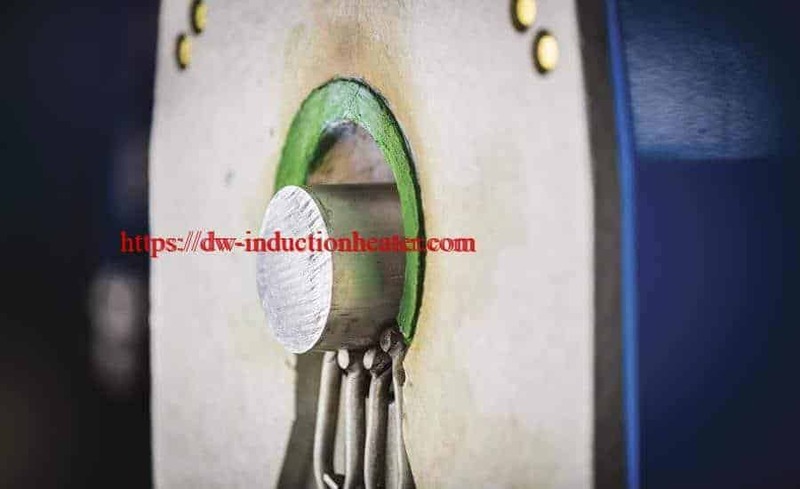 Because the users of most continuous induction billet-heating systems are familiar with the induction heating of steels and carbon-steel and stainless steel alloys, they provide a convenient point of reference in the consideration of the continuous heating of aluminum-alloy billets. 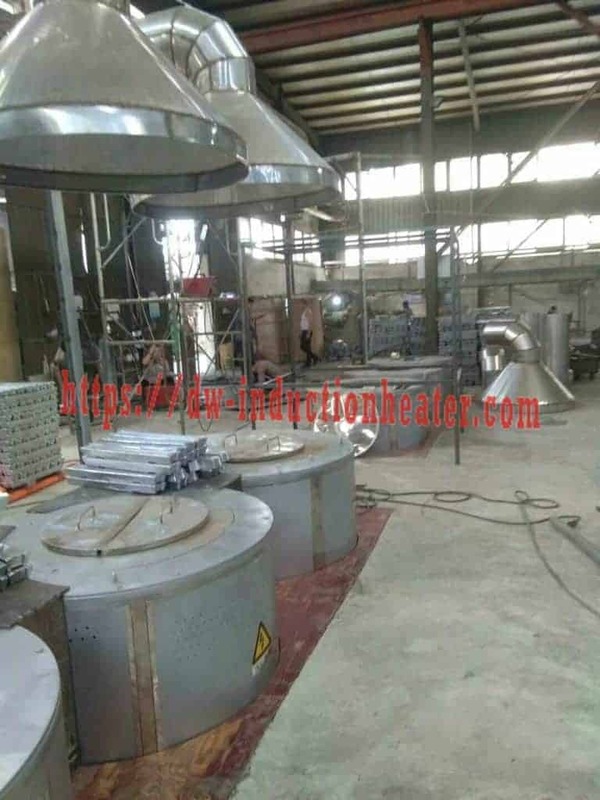 HLQ Induction Equipment Co.,Ltd specializes in continous aluminum billet heating furnace/aluminium billet heater for heating aluminum billets/bars/rods before the hot formging, extrusion, hot rolling and cutting,etc. 24h Continous Billet Heating Furnace with Induction for copper/brass,aluminum,iron steel before the hot formging, extrusion, hot rolling and cutting,etc. 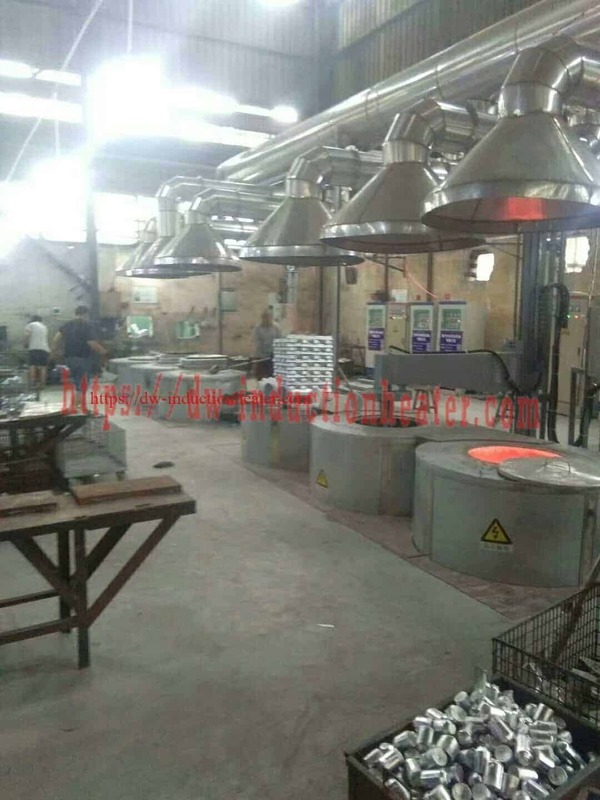 Application:Billet Heating Furnace mainly apply for the whole metal materials heating before the forging, extrusion, hot rolling and cutting,and metal materials quenching and tempering, annealing, tempering and other heat treatment as a whole. 1. Uses advanced electronic circuit control, with over-voltage, over-current, limiting pressure, current limiting, lack of phase, undervoltage, underwater pressure, phase sequence automatic identification, cooling water temperature alarm protection and many other protection features. Power factor automatic adjustment function. From the cold charge to the casting during the entire cycle regardless of how the furnace conditions change can be achieved, automatically maintain the power to the furnace, so that the maximum amount of molten metal per kilowatt, the shortest same power heating time, thus increasing the profits of manufacturers,increased labor productivity. 2.Control line dedicated integrated box and high pressure area are fully isolated, keep the control room clean and cool. Greatly improve the control circuit board life and system reliability. 3.High-power converter devices preferred from international and domestic well-known manufacturers, and run at 50% of the rated capacity, so with 100% design safety factor, increasing the overall system reliability. 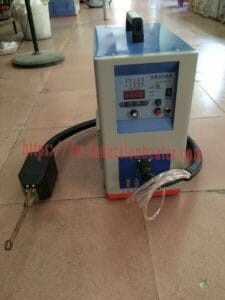 4.The equipment uses large air cooling copper, compared with the water-cooled copper, more energy for heating, increased efficiency, don’t need maintenance. 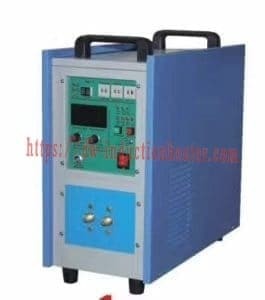 5.Power start using zero voltage sweep start, no impact, in the state of no-load, heavy load, cold steel and other states can be reliable from the dynamic, stable and reliable, trouble-free for a long time and facilitate to maintenance. 1. Heating quickly, heating temperature uniformity, less oxidation loss, metal composition evenly. 2. Can be directly heated from the cold material, easy to replace. 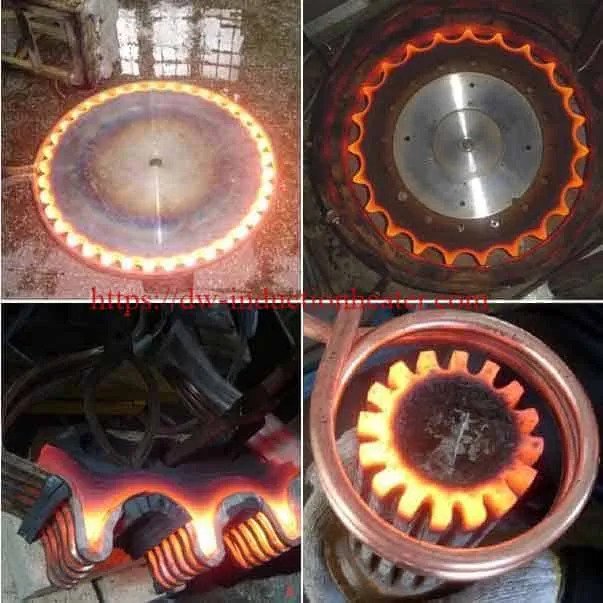 As the principle of medium frequency induction heating is electromagnetic induction, the heat generated by the workpiece itself, so this heating method heating quickly, oxidation very small and high heating efficiency, with good process repeatability. Automatic feeding and automatic discharge of the seizure device selected, coupled with the dedicated control software developed by our company, without automatic operation can be achieved. 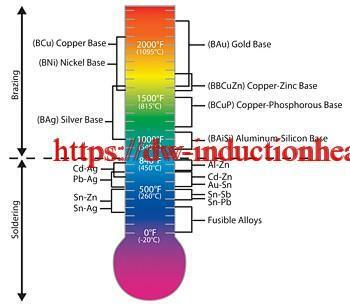 Heating uniformly, the core table temperature difference is small. The temperature can be precisely controlled by the temperature control system. According to the different size of the workpiece, to be equipped with different specifications of the induction induction furnace. 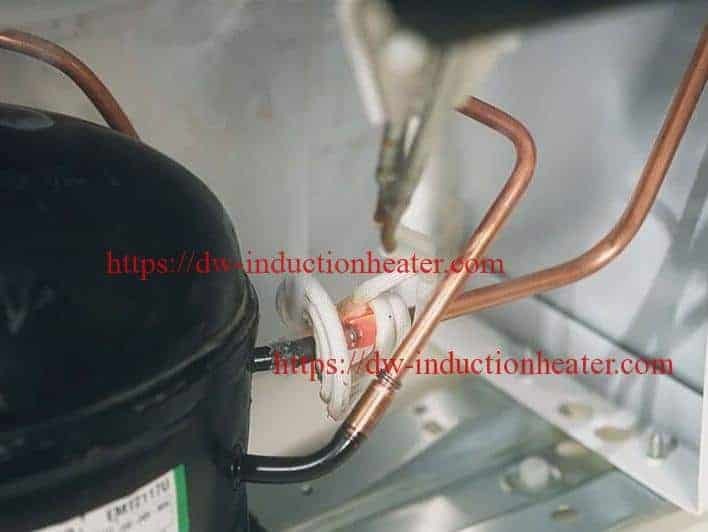 Each furnace are designed with hydropower quick change connector, so that the furnace is easy, fast and convenient to replace. A full set of equipment with water temperature, water pressure, over current, over voltage, lack of phase protection, and with over temperature, lower limit alarm device. So that reliable protection when the equipment in the fault, without damage to components. High heating efficiency, compared with other heating methods, reducing energy consumption effectively. Equipment in line with environmental requirements, no pollution. In the forging industry, the energy consumption when heated to 1250 ºC is less than 390 kwh / t.
Aluminium Scraps Recycling Melting is the process by which scraps aluminium can be reused in products after its initial production. The process involves simply re-melting the metal, which is far less expensive and energy-intensive than creating new aluminium through the electrolysis of aluminium oxide (Al2O3), which must first be mined from bauxite ore and then refined using the Bayer process. 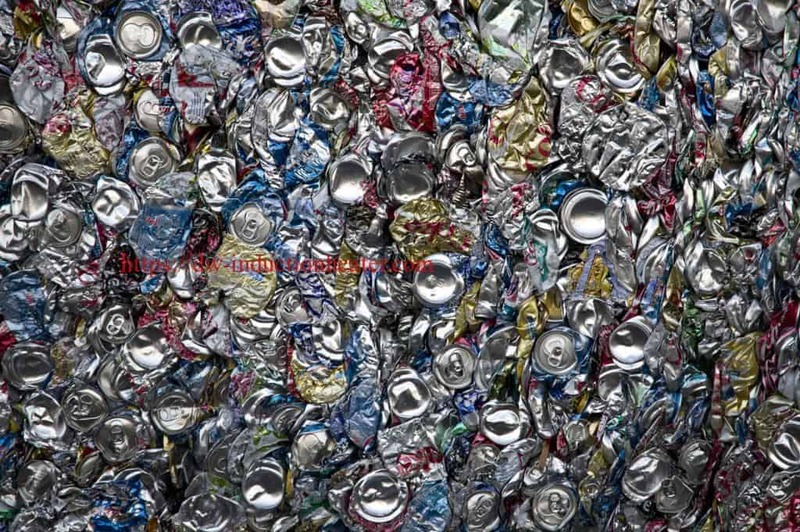 Recycling scraps aluminium requires only 5% of the energy used to make new aluminium from the raw ore. For this reason, approximately 36% of all aluminium produced in the United States comes from old recycled scrap. Used beverage containers are the largest component of processed aluminum scraps, and most of it is manufactured back into aluminium cans. 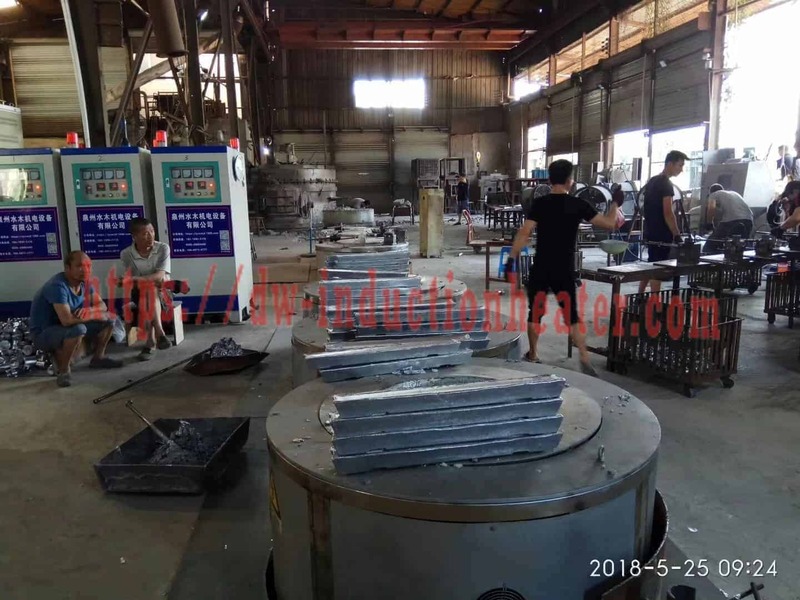 HLQ Induction Equipment Co provides the leading Aluminium Scraps Recycling Melting Furnace for recycling aluminium Scraps/cans/ingots and dross for industry aluminum recycling filed. A Aluminum scraps/ingots/cans recycling furnace operator will place aluminum parts or aluminum ingot/scrap as a charge in the induction melting aluminum recycling furnace and start the furnace to begin the melting process. Adding more aluminum charge this process is advisable as molten aluminum transmits the heat better. 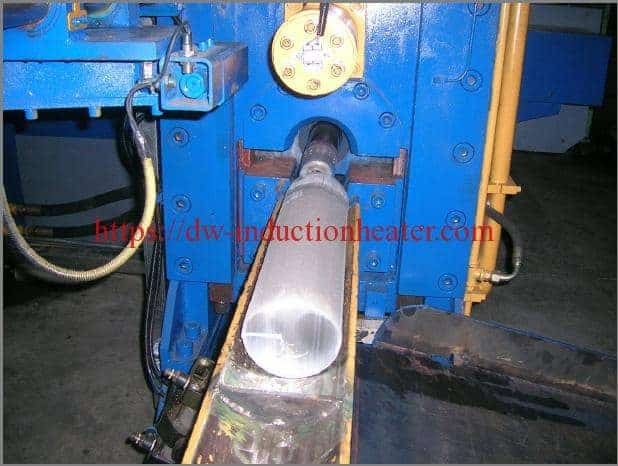 The objective is for brazing of multiple joints on refrigerator pipes using induction heating. DW-UHF-6kw-III handheld induction heater can braze multiple joints located in predefined positions in the assembly. Brazing alloy rings are placed on the joints prior to the brazing process. The system can be integrated to accommodate different production line speeds and multiple assemblies. High quality and repeatability of the brazed joints. Flexible system – can be easily re-programmed to accommodate different process requirements. Plasma is characterized as an electrically neutral medium of unbound positive and negative particles, with an overall charge of roughly zero. Like a gas, plasma has no defined shape unless enclosed in a container. To generate plasma, we apply an electrical field to a gas, with the goal of removing electrons from their orbit around the nuclei. This creates a mix of ions and free-flowing electrons, which give the plasma key properties, including its electrical conductivity, a magnetic field, and sensitivity to external electromagnetic fields. To generate plasma, we apply an electrical field to a gas, with the goal of removing electrons from their orbit around the nuclei. These free-flowing electrons give the plasma key properties, including its electrical conductivity, a magnetic field, and sensitivity to external electromagnetic induction heating fields. Renowned across the gas and pipeline processing industries, HLQ MYD series Pipeline and Tube Coating Systems are globally acknowledged for their ability to provide the highest levels of quality and performance in pipe coating, heat treatment and preparation applications. HLQ MYD series offshore systems revolve around field joint processing, with a series of induction systems utilized for heating and coating of field joints on pipe laying vessels. Renowned across the gas and pipe processing industries, HLQ MYD series Pipe and Tube Coating Systems are globally acknowledged for their ability to provide the highest levels of quality and performance in pipe coating, heat treatment and preparation applications. 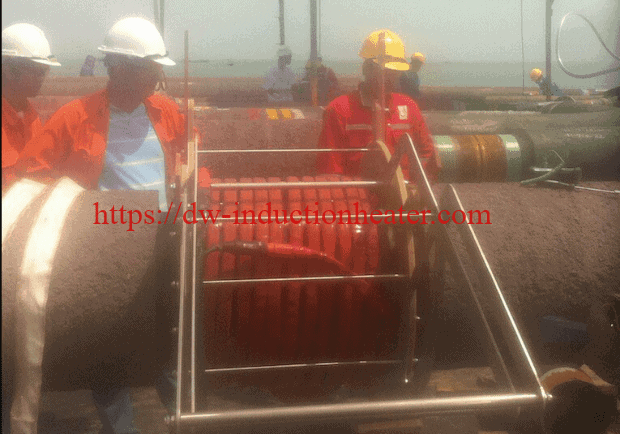 HLQ MYD series offshore systems revolve around field joint processing, with a series of induction systems utilized for heating and coating of field joints on pipe laying vessels. Modern technology has placed increased emphasis on coatings’ corrosion protection, electrical characteristics, thermal properties, appearance, and other special properties. Such coatings have included simple lacquers and paints, plastics, ceramics, metals, and various chemical conversion coatings. Induction heating has found increased application for coatings which must be ‘cured’ or ‘dried’ rapidly. 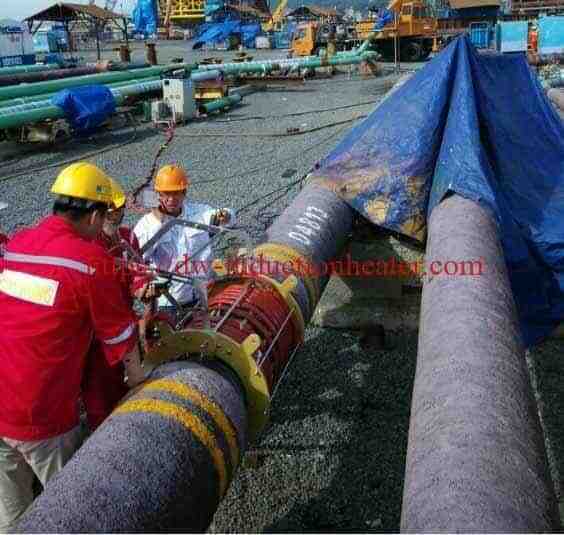 Induction is suitable for either drying pipe after alkaline cleaning and rinsing, or for curing coating applied to the surface. 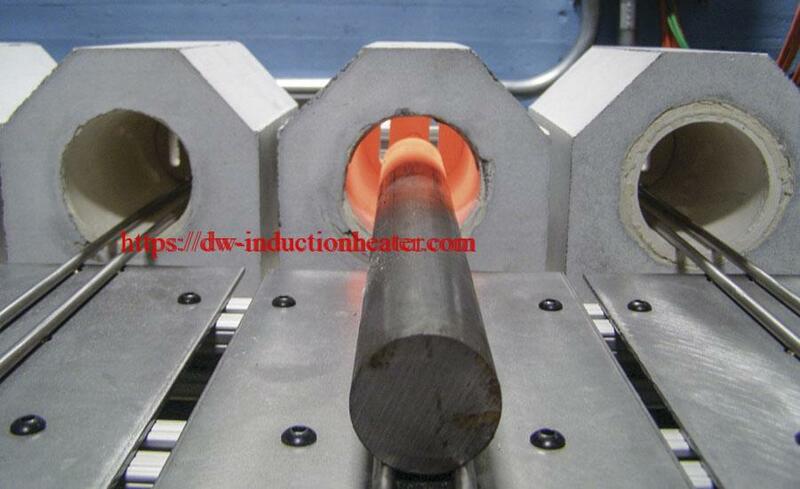 Induction heating is particularly applicable to high-speed continuous coating lines. 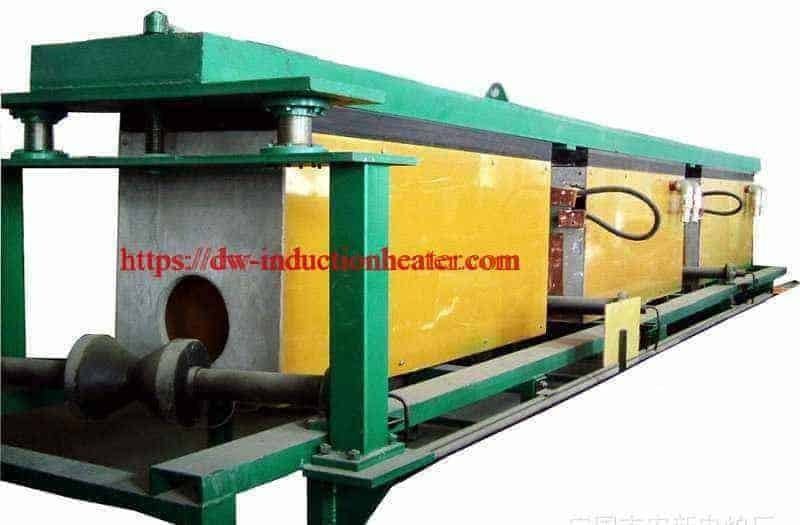 Since heating occurs directly in the pipe as it passes through an induction coil, it is heated almost instantaneously to a controlled temperature. This allows a short heating zone for processing, saving space and preventing problems associated with a shutdown in the processing line, such as excess heating of the wire coating from residual heat. 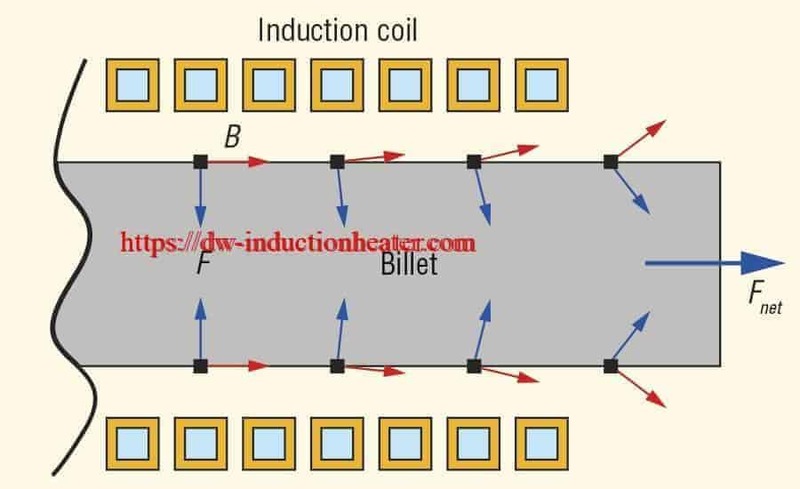 Integration of an induction heating operation with a production line is simple because of instantaneous heat control and ease of transporting the wire though the short induction coil. 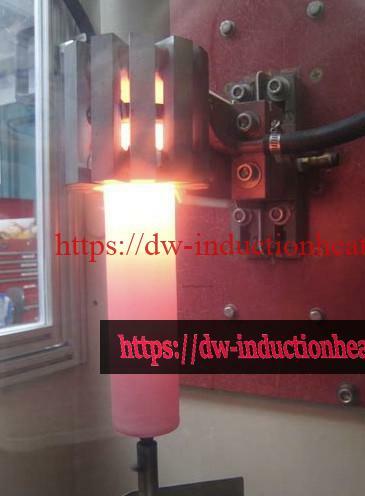 High frequency induction brazing stainless steel tube to stainless steel fitting with DW-HF-25kw-A induction heater. Induction brazing copper to brass fitting using brazing alloy and flux within 60 seconds. For Induction Brazing Copper to Brass, first the copper tubing and brass fitting were assembled together. A pre-form of the silver brazing alloy was seated above the joint, and flux was added. was centered in the coil. After 60 seconds in the coil, the brazing was complete. 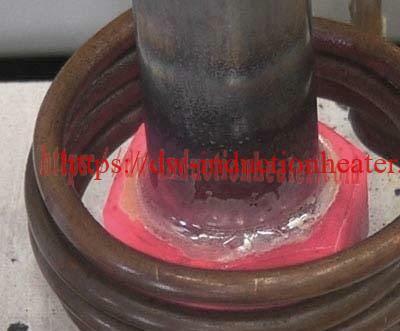 The material was cooled in water following the completion of brazing. The joint was then cross-sectioned to validate that the induction brazing process had produced a strong, high quality joint.